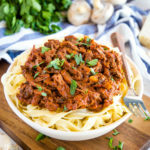 This Easy Slow Cooker Beef Ragu is comfort food at its finest, and a super simple weeknight pasta meal that the whole family will love! Heat a large skillet (I prefer cast iron) over medium-high heat. Add the oil. Season the beef cubes with salt and pepper on all sides and place in the skillet to brown. Be careful not to overcrowd the beef, or it will steam and not brown. Brown the beef cubes on all sides, in batches. Don't worry about cooking the beef through at this stage - just go for a deep golden brown colour on the outside. Remove the beef cubes to a plate when they've finished browning and add the onions, garlic, carrots, and mushrooms to the hot skillet. Saute for a few minutes until the onions and carrots are softening and the mushrooms have begun to release their juices. Turn off the heat and add the browned beef and the sauteed vegetables to the pot of your slow cooker. Pour in the wine, add the herbs and the crushed tomatoes. Turn on your slow cooker and cook on high for 5-6 hours or on low for 8-10 hours. Before serving, shred the beef in the sauce (sometimes removing the pieces of beef to a plate or cutting board helps, returning it to the sauce after shredding). Serve over Linguine or Papardelle noodles (long, flat noodles) prepared according to the package directions, with some freshly shaved parmesan and fresh herbs, if desired. This sauce can be prepared ahead of time. Simply prepare according to recipe directions and freeze the sauce in reusable containers for meal prep. Chuck roast or flank steak, cut into cubes, also works well in this recipe.